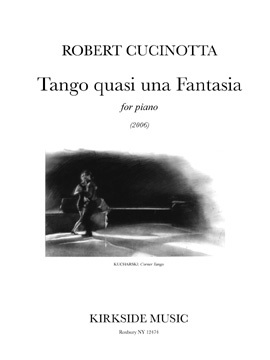 Pianist Justin Kolb performed, “Tango quasi una Fantasia,” (2006) a piece by American composer Robert Cucinotta, at the Grusin Music Hall, in Boulder, CO on October 8th, 2011. 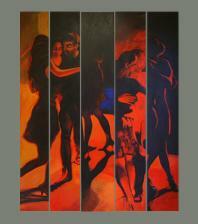 I am honored that Robert chose my charcoal drawing, “Corner Tango,” as the cover art for his composition. 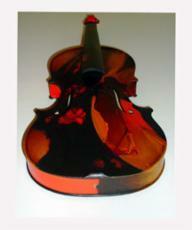 In Autumn 2009, a beloved friend from the Ithaca Tango community asked me if I would care to paint a violin for a fundraiser for the Cayuga Chamber Orchestra. I was delighted. And, of course, there was no choice but to listen to the calling and choose Tango as the subject matter. to Tia K. who won "Tango Rose" in the CCO 2010 Auction! It took at least two weeks living with the violin to get a sense of its form as a canvas, and then the composition began to take shape. But only so much so that I could understand it in parts. I would devise a plan and, as I would start to paint, the composition would demand something else, which was rather delicate to do on a musical instrument. Dylan Race, the gentle and wise luthier on the project, was extremely patient as it took me over two hours just to paint the pegs while he waited in the wings to string it together. There were seven artists who were honored with the task of visually enticing these already beautiful forms. I hope you joined in on the fun and purchased a ticket, or two or three, for the raffle that took place on April 24, 2010, where, on the last concert night of their season, the CCO drew the winning tickets! In January 2009, the Art and Tango communities of Vancouver, Washington, and Portland, Oregon welcomed me as colleagues hosted an exhibition of my art at the North Bank Gallery in the growing Arts neighborhood of downtown Vancouver. Jay, a Portland Tango DJ and teaching enthusiast, spiced up the event with wonderful music and partnered with me to teach a lesson during the opening. Thanks to the many wonderful people who made this event special, and to Rebecca S. and Greg L. who made it possible. If you have ever met Stephen Baker, the talented and spirited master of publicity and piano, you'll understand the fun I experienced with the opportunity to hang my art onstage with the Buffalo Philharmonic Orchestra. 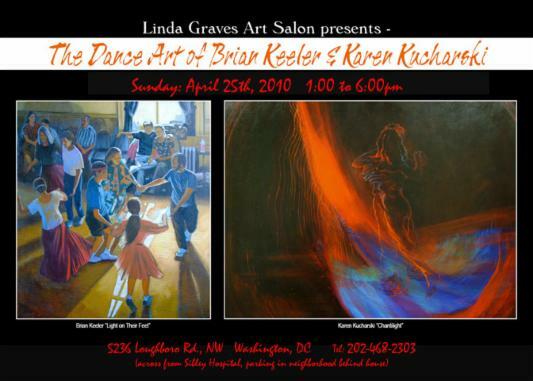 His effervescence and humor made troubles about hanging three such large works from shoestrings disappear and, what's best, is what appeared in place..... a spectacular performance with musicians, dancers, & art! "In this beautiful volume of photographs, Enid Bloch captures the warmth, infectuous enthusiasm, and deep humanity of JoAnn Falletta, music director of the Buffalo Philharmonic Orchestra. Uniquely revealing images take us right on stage - and behindstage - with one of the nation's great conductors..."
To preview the book online, visit www.enidblochphotography.com. 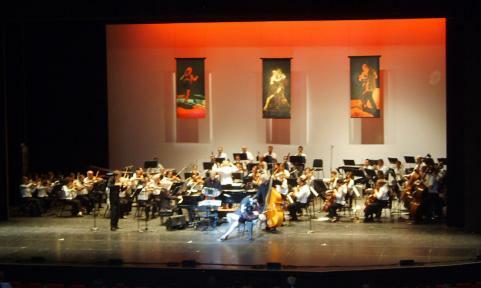 Tango Art Paintings by Karen Kucharski onstage, August 1st, 2008, with the Buffalo Philharmonic Orchestra, guest musicians "Quartango," and dancers, Roxana & Fabian Belmonte at Artpark in Lewiston, New York. 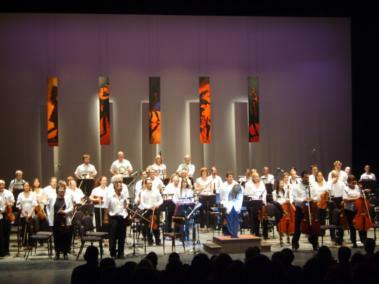 Thanks to the many behind-the-scenes players from: the Buffalo Philharmonic, Artpark, and the Buffalo Tango community. The Artist offers special regards to Stephen Baker, Gretchen Jamieson, and others from the BPO and Tango endeavors whose patience and caring made it work.